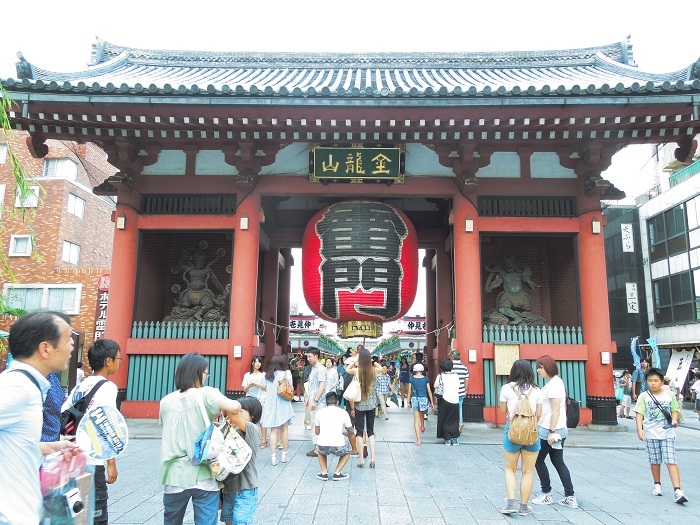 The symbol of Asakusa, "Kaminari Mon (Thunder gate)"
Asakusa is the popular sightseeing spot that you can see and enojoy the old Japanese customs and landscape. Asakusa is centering on "Sensō Temple （浅草寺）", and it takes 5 minutes on foot from Asakusa station to the entrance of Sensō temple, "Kaminari Mon （雷門, literary "Thunder gate"）", and the main street, "Nakamise Street （仲見世通り）" is inside the gate. 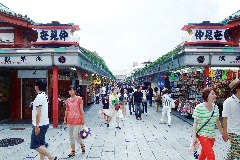 In this street, there are a lot of stalls, and you can buy the specialty of Asakusa, "Age-manjyū (fried manjyū)", Japanese classic snaks, and traditional crafts. 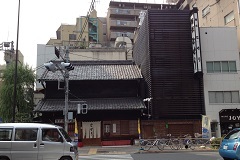 The main stracture of Sensō Temple is the end of the street, and there is a big incense burner called Jyōkōro （常香炉）. It is said the smoke has healing power, so many people fan the smoke into the parts of the body where are aching. Also, Kannon （the goddess of mecy） is deified in Sensō temple, and it is believed she gives every kinds of lucks if you only visit. Nakamise street is always crowded. Of corse, there are other attractive spots in Asakusa. For example, in Kappabashi Dōgu Street （かっぱ橋道具街）, there are many stores speciallizing in tools and instruments in kitchen. You can see crious and novel goods in the street. Among them, you may be especially suprised at the elabolation of food samples. Also, many lomg-standing restaurants in Asakusa. These stores were established more than 100 years ago, and you can enjoy Tempra, soba, and the local food of Tokyo, "Dojō Nabe (the hot pot dish of loach)" with its history. Senō temple was established in 628, and the oldest temple in Tokyo. Around 30 million tourists visit here every year. 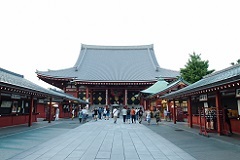 Especially in Hōzuki Market (7/9~7/10) and Hagoita Market (12/17~12/19), the temple is overflowed by visitors. English, Chinese (traditional), and Korean pamphlets are arranged. 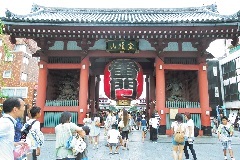 Kaminari gate is the entrance of Sensō temple and the symbol of Asakusa. The statue of the right side is Hūjin (The god of wind) and that of left side is Raijin (The god of thunder). The object hanging the gate is a chōchin (Japanese lantern), and is renewed every 10 years (the next renewal will be in 2023). Most stalls open everyday from 9 a.m. to 6 p.m. (at least, all shops open from 10 a.m.). 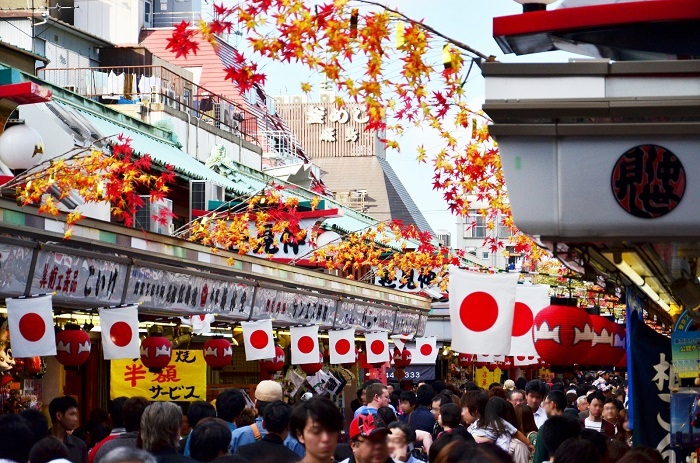 In Nakamise street, there are a lot of stalls that sell Japanese traditional snaks and crafts. Especially, age-manjyūs （揚げ饅頭） are well-known as the special product of Asakusa. Also, Shin-Nakamise street cross the street vertically. Shin-Nakamise street is long street with an arcade, there are a lot of shops too. 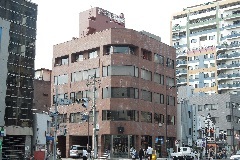 Also, the end of Shin-Nakamise street, a big department store called Rox is located. Regular Holiday: Most stores are closed in Sunday and national holidays. Business hours: Most stores open from 10 a.m. to 6 p.m.. 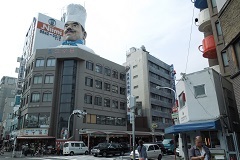 In Kappabashi Dōgu Street, there are more than 170 shops speciallizing in tools and instruments in kitchen. You can buy kitchenwares for family and business use, and many exquisite food samples are sold. Regular Holiday: open 365 days. 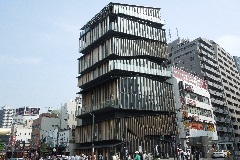 Business hours: (Shops) From 10 a.m. to 8 p.m., (Restaurants) From 11 a.m. to 10 p.m.
Matsuya department store & EKIMISE is the largest department store in Asakusa. 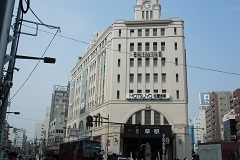 This department store handles mainly foods and clothes. The second floor is Asakusa station of Tōbu railway. Business hours: From 9 a.m. to 6 p.m. Including Japanese drums, more than 900 drums from all over the world are displayed, and you can play some of them. The 4F is a museseum, and othe floors are drum shops. Business hours: From 11 a.m. to 9 p.m.
Komagata Dojō is the famous restaurants specializing in loach dishes. The most popular menu is a stewed loachs （どぜう鍋、Dojō naba） that stew loaches soaked in sake with stock mixed miso. In my opinion, I think this is the most delicious cuisine in Asakusa. Business hours: From 9 a.m. to 8 p.m.
Asakusa Culture Tourist Information Center is a category 3 TIC, and you can ask stuffs about tourism information in English, Chinese, and Korean. In the building, free Wi-Fi spots, PCs, an exchange office, and a ticket counter are set up. 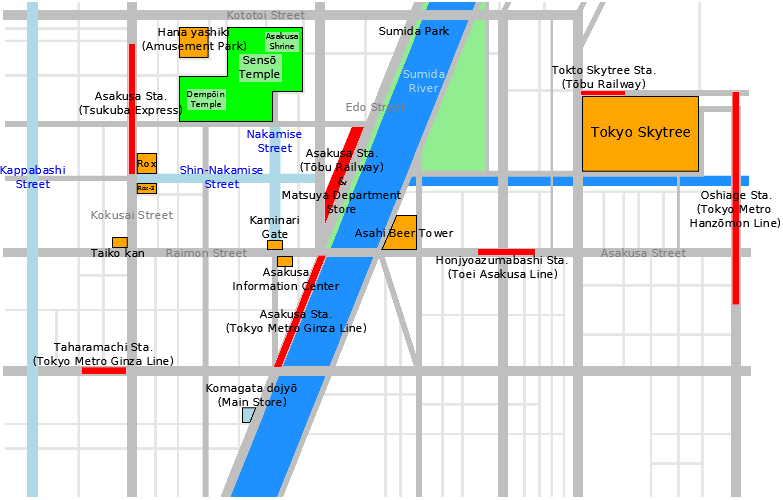 Also, english speakers guide foreigners around Asakusa every Saturday and Sunday with no charge and reservation. If you want more information, please visit the official site.